You are at:Home»Herbs»Prunus amygdalus Batsch. Latin name : Prunus amygdalus Batsch. Description : Almonds are one of the most nutritious foods around, loaded with calcium, iron, protein, potassium and magnesium. They have no cholesterol and are high in polyunsaturated oil. The sweat fruit and its oil are considered aphrodisiac, cerebral tonic, demulcent, diuretic, emollient, laxative, lithontriptic, nutritive, stimulant and as well as being a nervine tonic. It soothes dry skin, enhances brain power, relieves tension, reduces bad cholesterol (LDL), removes constipation, fights dandruff, kills lice, nourishes the body and keeps it warm in winters. 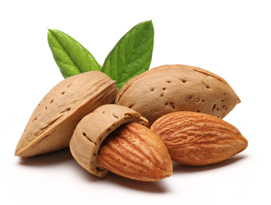 Almonds increase libido and enhance general sexual performance in cases of frigidity too. Sweet almond oil is often used as a carrier oil, acting as a base for blending essential oils for the purpose of massage or other forms of treatment. Rich in vitamins, it is particularly good for dry skin and blends with other oils. It can be used for face or body massage on people of all ages. It is used with phenol to treat rectal prolapse in infants. Recommended Dosage : Kernels : 7 to 11 pc; Oil : 5 ml to 10 ml. Contraindication : Persons allergic to tree nuts should not use Almonds.